This lesson can be presented using a turtle puppet or the teacher can just tell the story. Bible Story References: Exodus 1-3, the story of Moses. 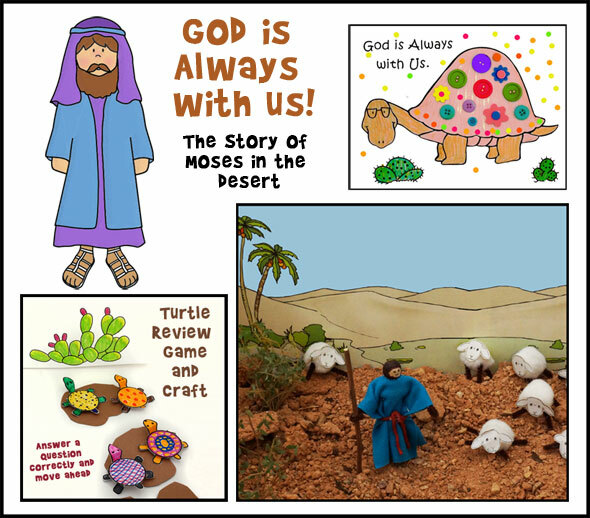 Teaching Concepts: God is always with us like he was with Moses when he was hiding from Pharaoh in the desert of Midian. God made us and knew us before we were even born. 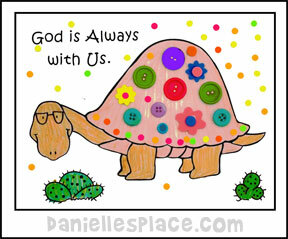 A turtle theme is used to remind children that God is always with us just like a turtle's shell is always with the turtle. 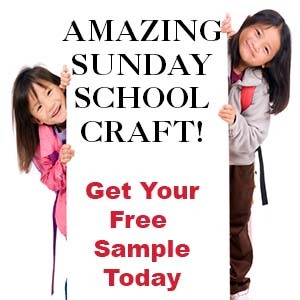 The following crafts and activities come from the Bible lesson "God is Always With Us!" from The Resource Room. This lesson is available on The Resource Room, a subscription site. Children color the turtle picture and then glue items such as paper pieces, cereal, pieces of colorful material, fun foam shapes, or confetti to decorate the turtle. Children can also use Dotters to decorate their turtles. Note: Do not use buttons or small objects with preschool children. 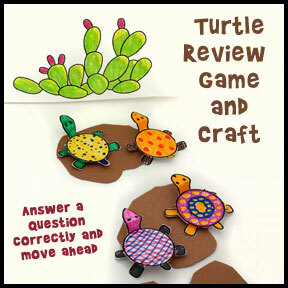 The object of this game is to be the first player to have your turtle reach the cactus by answering questions correctly. Children make their own turtle game pieces by coloring the turtle patterns and folding the legs down so that the turtles stand. They take turns answering the questions about the lesson. If a child answers correctly, he or she can throw a die and move their turtles the number of spaces shown on the die. The first player to have his or her turtle reach the cactus wins. 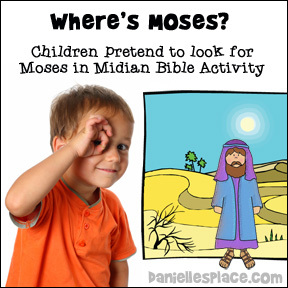 In this activity preschool children are reminded how Moses had to run away and hide from Pharaoh in the desert of Midian, but even though Moses was away from his family, he wasn't alone. God was with him and had a plan for his life. Children take turns hiding a Moses figure in "Midian" and the other children look for it. 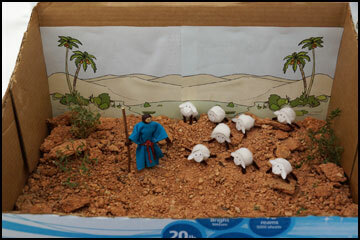 A printable Moses figure is available to members in both black and white and color versions. 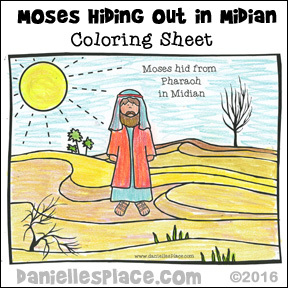 Children color the picture of Moses in Midian. As they work the teacher reminds them that Moses ran away from Pharaoh and hid out in the desert of Midian for many years. 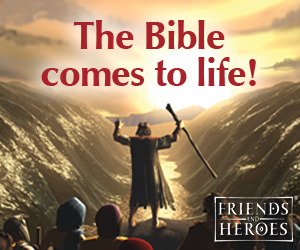 Even though Moses was away from his family, he wasn't alone. God was with him and had a plan for his life. Ask your children what they think the desert might have looked like and what colors they might see in the desert and tell them to color the picture using those colors. Also talk about how Moses might have felt having to leaving his family. Children make a stuffed paper turtle with the words "God is Always With You" written on the top. 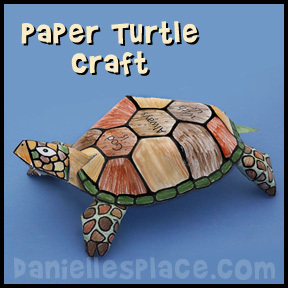 Older children will enjoy making this 3D turtle sculpture. It can be stuffed with crinkled up plastic bags or recycled paper to make it stronger. Young children will love playing in this "sand box". As they play ask them where Moses might hide if Pharaoh sent some people after him to find him. Egyptian Boy Fancy Dress Costume Age 9-12 Years Height 150cm - This costume is a great tool to help your children relate to the Bible story. Use it to act out the parts of Pharaoh.